A Month of Big Sundays (MoBS) is off and running with charity projects for everyone, every single day in May. Started in 1999 by Hancock Park resident David Levinson and about 300 others from his synagogue, Temple Israel of Hollywood, Big Sunday has morphed from a one-day event to year-round activities, with the emphasis on May. Last May, Big Sunday hosted and/or sponsored special events every single day of the month. “This has allowed us to take on even bigger projects, reach more people, make new alliances, and more easily fit in with everyone’s (and every organization’s) busy schedules,” said Big Sunday spokesperson Ashanntí Hill. Last year’s MoBS was such a success, they’re doing it again. TURNING POINT SCHOOL and Hillcrest Drive Elementary worked on beautifying Hillcrest last year. Photo by Joel Lipton. 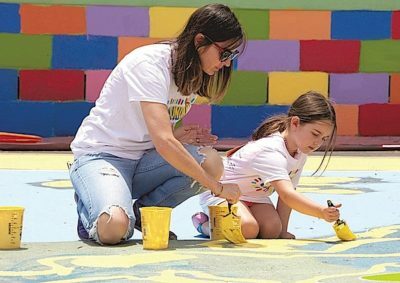 Projects range from helping to paint classrooms at area schools to visiting pets at shelters and meeting with at-risk youth, veterans and seniors. Other projects include writing letters to women recently diagnosed with cancer for Girls Love Mail on Tues., May 2, or helping stock the Salvation Army’s Food Pantry Sun., May 14. For more on A Month of Big Sundays 2017 — including how to get your school, club, faith group or business involved — email MoBS@bigsunday.org. For a list of projects, go to mobs.bigsunday.org/projects/2017-05/. Big Sunday’s second annual benefit gala is Thurs., April 27, from 6 to 9 p.m. at the Paramount Pictures Studio lot, 5555 Melrose Ave.
Hancock Park resident and longtime volunteer Zazi Pope, The Center for Early Education service chair Kara Corwin and architectural firm Tichenor and Thorp Architects will be honored at the event. For more information, go to bigsunday.org/gala.